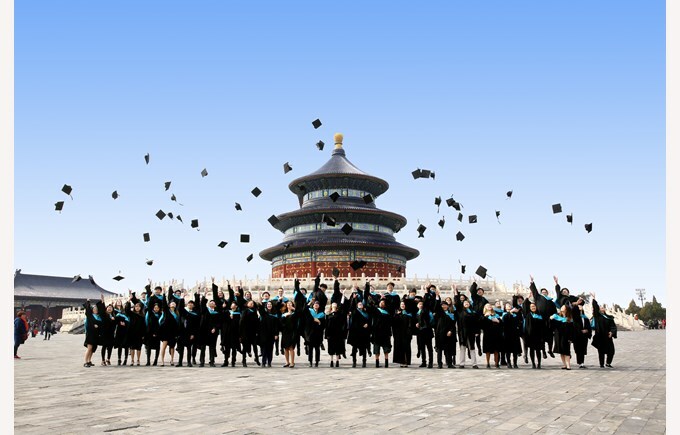 The British School of Beijing has a proven track record of producing excellent academic results year after year. In standardised testing of students at all levels, we sit well above the UK and global average. Our graduates are accepted into top universities worldwide. But a successful student cannot be judged on exam results alone. We make it our mission to ensure that all those who participate in our school life leave us as better, more able, more responsible and confident individuals, who uphold our core values of honesty, integrity, excellent manners and respect for others. We look to celebrate success, and our teachers are always on the look out to catch our student doing something special, whether it be academically or socially. We like informal praise, but we also have formal systems for rewarding our students with our House system and Merit scheme. Each year The British School of Beijing, Shunyi achieves excellent academic results. We wish to congratulate all our Year 13 students on an outstanding set of IBDP results. Our students' average score in the IB Diploma was 34, significantly ahead of the 2017/18 global average of 29.78 points. 16% of our students achieved 40 points and above. This is the level of attainment required to gain admission to the world's elite universities, such Cambridge, Oxford, Harvard and Stanford. We are delighted to announce that one of our students from our school received full marks — the maximum score of 45 points. This is an incredible achievement for these students as only 1 in 1,000 students worldwide received full marks last year on the IBDP. 86% of all grades achieved by BSB Shunyi students were A* - C.
43% of all grades awarded were A* - A, again significantly above the UK average of 20%. Grades A* - B accounted for over two thirds of grades awarded demonstrating a real depth of high performance across all subjects. 89% of our students achieved the benchmark figure of 5 A* - C, this compares with 67% in the UK. 100% Pass Rate! No examinations were ungraded. Jessica (Jaiqi) Feng: 1 A**, 8 A* and 1 A grades. Joshua Warwick: 9 A* grades. Zilin Cao: 8 A* and 2 A grades. George Bourne: 7 A* and 3 A grades. Charlize Su: 6 A* and 3 A grades. Lisa Iwanaga: 1 A**, 2 A* and 4 A grades. Sam Turner: 8 A* and 1 A grades. Bertha Wong: 7 A* and 2 A grades. Pei-Jung Hsieh: 1 A**, 5 A* and 1 A grades. Paul Vittot: 5 A* and 4 A grades. SeungWook Kim: 3 A* and 5 A grades. Janick Bohm: 3 A* and 5 A grades. Yearim Lee: 1 A**, 2 A* and 4 A grades. EunJae Lee: 3 A* and 3 A grades. Yiming Wei: 1 A**, 1 A* and 4 A grades. Yuejia Hu: 2 A* and 3 A grades. Valentina Kicker : 2 A* and 3 A grades. Yu-Ting Zhan: 1 A* and 5 A grades. Illiana Hins: 1 A* and 4 A grades. Zanda Stapelberg: 1 A* and 4 A grades. Anthony Zhang: 7 A grades. 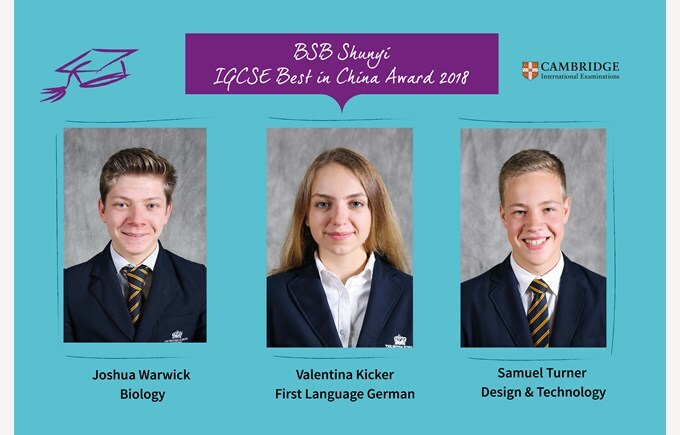 3 BSB students have received received 'Top in China' awards and ‘High Achievement’ honours for achieving the highest mark in China in the particular IGCSE subject. Each year our students receive offers from excellent Universities and Colleges from around the world. Please download document below for details. BSB students gain Top IGCSE results again in 2018!